Based on recent history, a “debate” between Governor Andrew Cuomo and his four general election opponents is likely to shed more heat than light on the issues facing the Empire State today. As typically formatted, such events are little more than joint news conferences—yielding a series of 30- to 90-second soundbites, never settling for long on any subject, and occasionally veering into testiness. Thirty-six years ago, however, two notably literate and intelligent candidates for governor of New York set a higher bar. 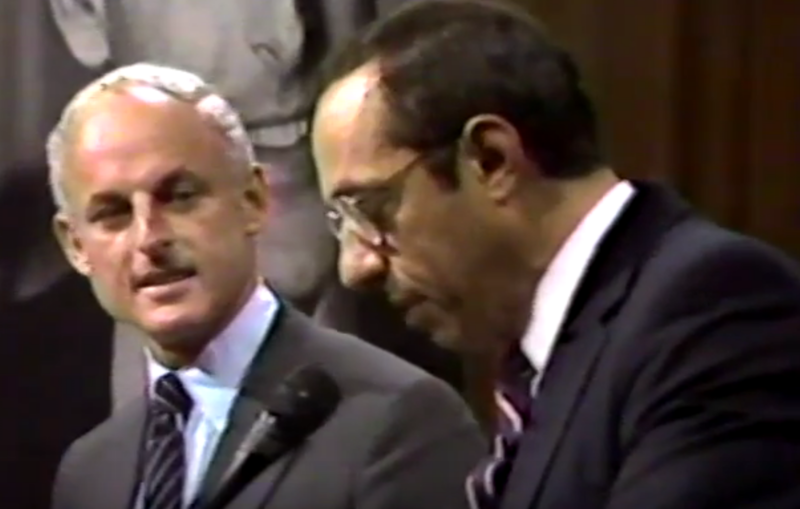 The public encounters of Mario M. Cuomo and Lewis E. Lehrman in the closing weeks of the 1982 gubernatorial campaign produced a substantive, often lively, at times intense, but consistently civil exchange of ideas. The Empire Center has unearthed videos of three of the five Cuomo-Lehrman debates, shared here as an example of how much (and, in some ways, how little) has changed in New York politics over the intervening decades. Ronald Reagan was in the second year of his presidency and New York City’s mid-1970s financial crisis was still fresh in memory when Cuomo and Lehrman vied to succeed Governor Hugh L. Carey, the two-term Democrat who had engineered the city’s recovery from virtual bankruptcy. In candidate profiles that ran on facing pages the weekend before the general election, The New York Times billed New York’s 1982 gubernatorial race as “A Referendum With National Overtones,” pitting “The Old Liberalism” against “The New Right”. Cuomo’s campaign relied on New York’s remaining urban Democratic machines and on the public employee unions whose support had made possible his primary win. Lehrman, only tepidly supported by legislative Republicans and GOP leaders, countered with a media-intensive campaign. He ultimately spent $14 million on the general election and Republican primary combined, nearly three times as much as Cuomo. The first Cuomo-Lehrman debate, sponsored by the New York Post, was held Oct. 7, 1982, in a ballroom of Manhattan’s Sheraton Hotel, before an audience of politicians, union activists and business leaders. As shown in the video, Post publisher Roger Wood introduced the candidates and explained the format, which was supposed to feature questions from a panel of three reporters. But the candidates mostly ignored the ground rules, plowing through their introductory remarks into a free-flowing, nearly hour-long exchange—with Cuomo the clear winner based on his platform skills alone, as summarized in a subsequent a subsequent column by Sydney H. Schanberg of The New York Times. Copyright WNET/Thirteen. Private recording of original broadcast posted here with permission of WNET/Thirteen. A few weeks later, the two candidates squared off on ABC-TV’s “This Week With David Brinkley,” answering questions from Brinkley and columnist George Will, linked below. In their final debate, aired the weekend before the Nov. 2 election, Cuomo and Lehrman faced off in a Manhattan TV studio for a special hour-long edition of “Inside Albany,” the weekly capital-based public affairs show. The candidates answered questions from the program’s knowledgeable hosts, Dave Hepp and Peg Breen, a format that allowed for a healthy dose of give-and-take. Video link courtesy of Inside Albany Records, Special Collections Research Center, Syracuse University Libraries, and WMHT. Note technical limitation: Program begins 2:26 into recording. Cuomo ultimately defeated Lehrman by 180,000 votes (51 to 48 percent), the third narrowest winning margin of the 18 New York gubernatorial elections in the post-World War II era. Lehrman never ran for public office again. An investment banker well known for his advocacy of a return to the gold standard, he has devoted much of his time and resources over the past 30 years to organizations focused on public policy, historical research and American studies, including the Gilder Lehrman Institute of American History. Now 80, he has authored or co-authored eight books, and is a noted Lincoln scholar. Mario Cuomo served three terms as governor, coming close to a run for the presidency in 1992, before losing to Republican George Pataki in 1994. Before, during and after his time in office, he published several books of his collected speeches and diaries—and his own book of reflections on Lincoln. Cuomo died, hailed as a “liberal beacon,” age 82, on January 1, 2015—the day his son was sworn in for a second term as governor. When NY gubernatorial debates were both civil and substantive: flashback to Mario Cuomo-Lew Lehrman in 1982.